Top Chef Season 16 Where are they now? Top Chef is a cookery competition reality television show that sees 16 chefs compete to be named the Top Chef after completing a number of challenges to avoid elimination. The challenges are judged by a panel of professional chefs and culinary, food and drink experts. There was a $200,000 cash prize and the competition was hosted in Kentucky. Find out what the Top Chef season 16 cast did next after appearing on Top Chef. Top Chef Season 16 contestants where are they now? Adrienne Wright was an Executive Chef from Boston, Massachusetts. She was eliminated from Top Chef in episode 13 after her pork dish failed to impress the judges. After the show, she returned to her role as executive chef of Boston Urban Hospitality, which runs four restaurants and she is expecting her first child in 2019. 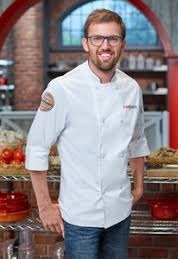 Brandon Rosen was a Private Chef from San Mateo, California. He was eliminated from Top Chef in episode 7 after his beef dish failed to impress the judges. After the show, he returned to his previous role as a Private Chef. Brian Young was a Chef De Cuisine from Boston, Massachussets. 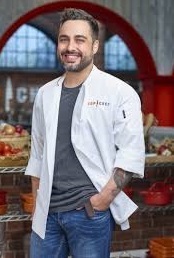 He was eliminated from Top Chef in episode 8 after his Porchetta salad was the weakest dish on the losing team. After the show, he did a number of cooking events and plans to open restaurant The Emory in the coming months. Brother Luck was a returning contestant and Restaurant Owner from Colorado Springs, Colorado. He was eliminated from Top Chef in episode 6 after his cocktail inspired canape failed to impress the judges. After the show, he returned to the restaurant he owns and plans to open restaurant Lucky Dumpling on March 26th 2019. Caitlin Steininger was a restaurant owner from Cincinnati, Ohio. 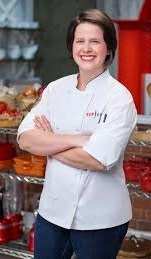 She was eliminated from Top Chef in episode 1 after her tomato cobbler failed to impress the judges. After the show, she returned to the restaurant she owns, CWC/ Caitlin is due to open a second restaurant Station Family + BBQ in early 2019. David Viana was an Executive Chef and partner at Heirloom Kitchen from Asbury Park, New Jersey. He was eliminated from Top Chef in episode 9 after his musical dish failed to impress the judges. After the show, he returned to Heirloom kitchen and was nominated for a Beard award. Edmund Eddie Konrad was a Chef De Cuisine from Philadelphia, Pennsylvania. He was eliminated from Top Chef in episode 11 after his boxing inspired dish failed to impress the judges. After the show, he returned to his position as chef de cuisine at Laurel Restaurant. Eric Adjepong was a chef and owner at Pinch & Plate pop up dining from Washington, DC. 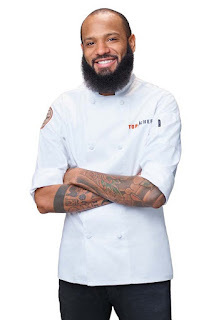 He was eliminated from Top Chef in the finale episode 15 and came in third place. After the show, he offers pop up dining experiences, private dining experiences and cookery classes. He was named one of People's Sexiest Chef's alive. Justin Sutherland was an Executive Chef and restaurant owner from St. Paul, Minnesota. 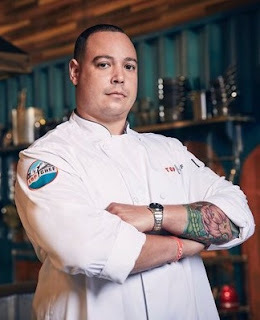 He was eliminated from Top Chef in episode 12 after his Yellowtail dish failed to impress the judges. After the show, he returned to his restaurant Handsome Hog as Executive chef and he also owns Stillwater’s Pearl & the Thief. In December 2018, he was appointed Head of Operations of the Madison Restaurant Group, overseeing a number of restaurants. 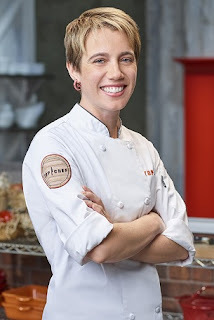 Kelsey Barnard Clark was the Top Chef season 16 winner after her 4 course menu impressed the panel. After Top Chef, she plans to use the prize money to renovate her restaurant KBC and she hopes to one day open a second restaurant. Kevin Scharpf was an Executive Chef and Owner at Brazen Open Kitchen & Bar from Dubuque, Iowa. He was eliminated from Top Chef in episode 3 after his Ricotta dessert with over salted cherries failed to impress the judges. After the show, he returned to his restaurant Brazen. Michelle Minori was an Executive Chef from San Francisco, California. 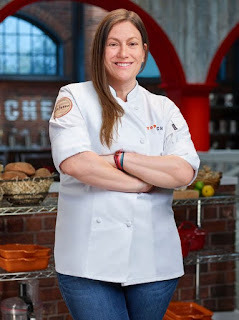 She was eliminated from Top Chef in episode 10 before rejoining the competition in episode 12 as the winner of Last Chance Kitchen. She was eliminated in episode 14. After the show, she is working as a restaurant consultant. Natalie Maronski was an Executive Chef from Philadelphia, Pennsylvania. She was eliminated from Top Chef in episode 2 after her Lemon Curd pie failed to impress the judges. After the show, she plans to return to the kitchen after taking a break. Nini Nguyen was an Executive Chef from Brooklyn, New York. She was eliminated from Top Chef in episode 5 after her dessert failed to impress the judges. After the show, she returned to Cook Space, teaching culinary classes. Pablo Lamon was a Chef De Cuisine from Miami Beach, Florida. 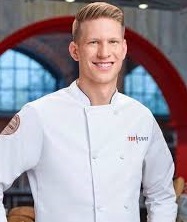 He was eliminated from Top Chef in episode 5 after his scallops failed to impress and due to his worsening performaces. After the show, he returned to his position at 27 Restaurant & Bar. Sara Bradley was a chef and restaurant owner from Paducah, Kentucky. She was the Top Chef season 16 runner up after her bacon dish let her down despite her strong menu. After the show, she returned to her restaurant freight house and is expecting her first child in May 2019.